So we’ve got our 12 notes, our note values, our rests and a system of putting it all on paper. (Check out the How to Read Music Crash Course if you haven’t yet). Now what? How does it become music? Very simply, it becomes music by organizing the notes in various ways: into scales, intervals and chords. And these become the basic building blocks of music. Let’s begin with scales. A scale is simply a set of notes arranged in order from low to high or high to low. These sets of notes are a kind of a subset of the 12 notes of the alphabet, from which composers build their music. There are hundreds of possible scales and each one provides the composer with different possibilities. In blues we get particular 5-note scales, in the Impressionism movement of the late 19th century we find a variety of 5- and 6-note scales and in the Church music of the middle ages we get sets of 7 notes. The scales that we’ll be concerned with in this course are two: the Major scale and the minor scale. As we’ll see these scales have one note that is fundamental and feels like ‘home‘. This note is known as the tonic and it’s usually the first and last note of the scale. And put the notes in order from the lowest to the highest. That’s a 7-note scale which is the basis of Mozart’s piece. Notice how it goes up step by step. The word scale, in fact, comes from the Latin word scala meaning ladder. The scale is a ‘ladder of notes’ – a sequence of musical tones arranged in order from lowest to highest or highest to lowest. That scale from Mozart’s example is a Major scale. In fact it’s the C major scale – which means that it’s the major scale beginning and ending on the note C. This is considered the simplest major scale because it uses only natural notes. On the piano we can play it just by starting from any C and playing all the white keys up or down till the next C.
Now the sound of the major scale depends on the particular arrangement of tones and semitones between the notes. The semitone is the name of the distance between two notes that are immediately next to each other. On the keyboard, a semitone is the distance from one key to the one immediately next to it. So why is it important to know the specific pattern of tones and semitones? The answer is that if you need a major scale starting from a note other than C, you must make sure that the sequence is preserved. What makes the characteristic sound of the major scale is specifically that pattern – if we change it, we get a different scale with a different sound and a different name. When we work out this new scale’s semitone-tone pattern, we find out that this new scale is not actually G major. This is because the semitone-tone pattern is not the right one for the major scale. The pattern ends with a tone – semitone – tone (instead of tone – tone – semitone). This means that the scale of G major requires the note F sharp (instead of F). In other words we could say that the key signature of G major is F sharp. Now let’s take it a step further. We can take the ending of the G major scale and create the scale of D major. Notice that to get the proper semitone-tone pattern we sharpen the seventh note again, in this case the note C. And so we can say that the key signature of D major consists of 2 sharps: F sharp and C sharp. Now if we kept going with this procedure we’d end up with a set of 12 major scales – each of them with their own key signature. Key signatures are written at the beginning of every staff of the music. Here’s an example in A major, which has a key signature of 3 sharps: F sharp, C sharp and G sharp. This is the beginning of a piano piece by Mendelssohn. Here is the circle of fifths showing all the key signatures of all the major scales. Observe how some key signatures have sharps and some have flats. Others can be spelled in different ways, such as C sharp major and D flat major. Notice the patterns in the circle: starting from C and moving clockwise: one sharp is added at a time (or one flat is removed at a time); the key is 5 away from the one before it. For example G major has one sharp. Moving one step clockwise we get to D (5 up from G) and it has two sharps. The minor keys work exactly the same pattern: from A to E to B (all are 5 away from the one before). Moving counter clockwise: starting from C, one flat is added at a time (or one sharp is removed at a time); the key is 4 away from the one before it. For example: F major has one flat. Moving one step counter clockwise we get to B flat major (4 up from F) and it has two flats. The minor keys also follow that same pattern: from B flat to E flat to A flat (all are four away from the one before). We just saw that the simplest and most basic major scale is the one that begins on C because it uses only the white keys and has no sharps or flats. But what if those same 7 notes, those same 7 white keys, were played in a different order. For example, what if we started and ended a scale on the note D rather than the C? This would make D the tonic, and the arrangement of tones and semitones is different than the one for the major scale. And what if, instead of starting from C or D, we started and ended a scale on the note E? Now the tonic is E and the sequence of steps is also different from the other two. These new scales are known in music theory as modes and they were highly fashionable in mediaeval music. There are 7 modes because each of the 7 notes from C, D, E, F, G, A and B can become the tonic of its own scale. What is very interesting is that each one has a different arrangement of tones and semitones so they all have a different sound quality or character. Throughout the centuries composers and musicians found a lot of varied uses for these Modes. They were the mainstay in the Church music of the Middle Ages, but also frequently found in folk songs and more recently they’ve been explored in Rock and Metal music, Jazz as well as 20th Century Classical music. One of these modes, the one on the note A is what we’re concerned with most in this course. This mode stuck throughout the Classical period and is now known as the natural minor scale. Since C major and A minor share the same key signature (that is, the same number of sharps or flats), they’re known as relative keys. So we can say that C is the relative major of A minor; and that A is the relative minor of C major. To find out which minor key is the relative of any major key, simply count six up from the tonic. For example, C major to A minor (C to A is a sixth); or G major to E minor (G to E is a sixth); or F major to D minor (F to D is a sixth). Here are all major and minor keys shown in the circle of fifths. The lowercase letters are the minor keys, the uppercase letters are the major keys. Now to get certain musical effects, composers of the past found it useful to change some notes of the natural minor scale and by doing so, they created 2 new variants of the minor scale. The first change to the natural minor scale was to its 7th note. As we’ve seen in this chapter, the 7th note is only a semitone away from the tonic in the major scale. So often times the 7th note of the minor scale was sharpened. This way it leads into the tonic just like the major scale. The minor scale with the 7th sharpened is known as the Harmonic Minor Scale. Now by sharpening the 7th note, the distance between it and the eighth is a half step. But at the same time, there is now an awkward musical distance between the 6th and 7th notes. Interval is the term for a musical distance – the span between any two notes. For example the distance between C and F is a specific interval and the distance between C and A flat is another specific interval. There are several different intervals and it’s important to recognize and label them because they are the basis of melodies and chords. There are two parts to naming an interval. The first is to calculate the number of steps within that interval. Let’s look at an example – these are the notes G and B. How many steps are within this musical distance? Let’s try another example. These are the notes C and F. How many steps are there between them? Always count up from the lower note. Always include that lower note as number 1 in your count. Let’s begin with the first two types. A major interval is the distance between the first note of a major scale and the 2nd, 3rd, 6th and 7th note above it. (Read that again, it’s important). So for example, which one of these intervals is a major interval? To work it out, we need to consider the major scale of the lower note. In this case, it’s the note C. As we’ve seen earlier, the scale of C major consists of all the white keys – it has no sharps and no flats. So the major interval is the first one. The other interval has an E flat and this note is not part of the scale of C major. This cannot be a major interval. The full name of the first interval is major third. The third is the distance and major is the quality. Let’s work out another example. Say we have the note G. Which note is a major seventh above G? A seventh above G must be some sort of F.
And to check whether the F needs to be flattened or sharpened, we must consider the G major scale. As we learned in previous lessons, the scale of G major requires an F sharp. So a major seventh above G is F sharp. Now fourths, fifths and octaves (the musical term for an interval of the eighth) are never called major intervals. Instead they are known as perfect intervals. Perfect intervals are fourths, fifths and octaves whose higher note is part of the major scale of the lower note. For example, what is this interval? The distance between A and E is of a fifth. Since the note E is part of the major scale of the note A (the lower note), this interval is a Perfect Fifth. Here’s another example. What is a perfect fourth above F? A fourth above F must be some kind of B. And with our knowledge of scales from before, we know that the key signature of the F major scale is B flat. So a perfect fourth above F is B flat. Intervals can go down too. In this case simply count down in reverse. For example what is a Perfect fifth below A flat? A fifth below the note A flat must be some sort of D. And to make it perfect, we must flatten the D so that the interval is D flat to A flat. Because the note A flat is part of the major scale of D flat. So we’ve seen that when the higher note is part of the major scale of the lower note, the interval is either major or perfect. This means that the intervals between a tonic and all the notes in its major scale are either major or perfect. Let’s see another example. What’s a minor sixth above the note D? Here is another example. Is this a major seventh or a minor seventh interval? Since the lower note is E flat, we must keep in mind the key signature of the E flat major scale – it has 3 flats: B flat, E flat and A flat. This means that D natural is part of the major scale and so the interval E flat – D is a major 7th. Since the D is flattened, this interval is a semitone smaller than its major counterpart. This makes it a minor seventh. Now keep in mind that since 4ths, 5ths and octaves cannot be major, they cannot be minor either! Instead, they become diminished. And finally, is this a minor seventh or a diminished seventh interval? Since the lower note is G, we must keep in mind the key signature of the G major scale – it has 1 sharp: F sharp. This means that G to F sharp is a major seventh. One semitone smaller, G to F natural, is a minor seventh. As we’ve learned, an interval that is one semitone smaller than a minor one, is a diminished interval. So this interval is a diminished seventh. Here is another example. What’s a major second above F? Since the lower note is F, we must keep in mind the key signature of the F major scale – it has 1 flat: B flat. This means that F to G is a major second interval. F to G sharp is a semitone larger than that, so this is an augmented second. When three or more notes are played together, they produce a chord. Any three or more tones can make a chord. And that means that there are thousands of ways that we could combine any of the 12 notes into chords. But (luckily) our chord system is based on the most simple of chords known as triads. Triads consist of 3 different notes named root, third and fifth. The root is the first note of the chord. The third of the chord is a third above the root and the fifth of the chord is a fifth above the root. So let’s say we have the root F.
What’s a third above F? F is first, G is second and so the note A is the third. What’s a fifth above the note F? F is first, G is second, A is third, B flat is fourth and so the note C is the fifth. That’s it! That’s our triad: F – A – C.
Let’s build another triad on the note G. What are the root, third and fifth? The root is G itself. The third is a third above the root: the note B. The fifth is a fifth above G: the note D. And that’s our triad on G: G – B – D.
So the pattern to write triads is quite simple. Start with the root, skip a note to get to the third, and skip another note to get to the fifth. In the first example above, we started with F, skipped G to get to the third A, and skip B to get to C. That’s our triad: F – A – C.
And any 3 consecutive notes in that sequence make a triad. For example, if we start on the note B, the third and fifth notes will be D and F.
Or if we start from D, the third and fifth notes will be F and A. Notice also that every note is part of 3 triads. Any one note is a root of a triad, the third of another triad and the fifth of yet another triad. Let’s take the note C for example. It’s the root of C – E – G.
The third of A – C – E.
And the fifth of F – A – C.
To finish our basic music theory course, we’re going to look at how to construct the four basic types of triads: 1) Major triads, 2) minor triads, 3) diminished triads and 4) augmented triads. As we’ll see, each of these triads have a unique sound character. Always keep in mind that the two upper notes are called “major third” and “perfect fifth” because they form these intervals in relation to the root. Always keep in mind that the two upper notes are called “minor third” and “perfect fifth” because they form these intervals in relation to the root. 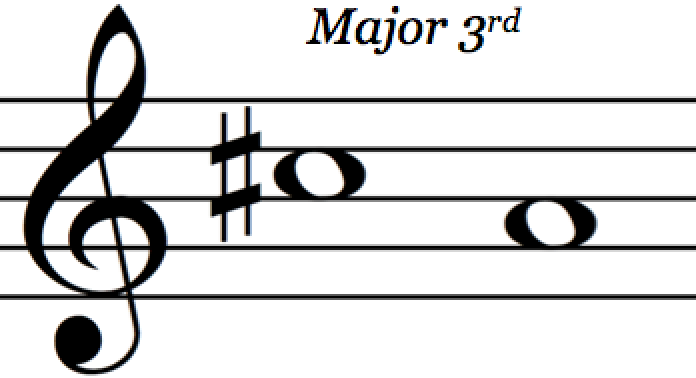 Always keep in mind that the two upper notes are called “major third” and “augmented fifth” because they form these intervals in relation to the root. 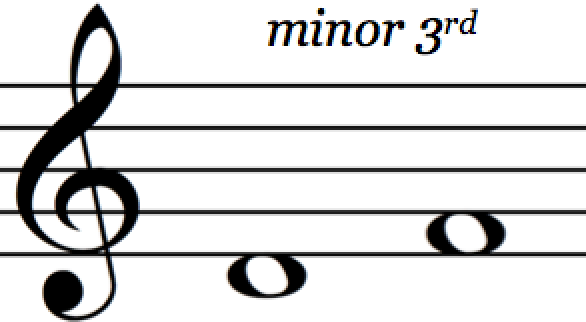 Always keep in mind that the two upper notes are called “minor third” and “diminished fifth” because they form these intervals in relation to the root. And that’s the end of our crash course! We’ve been through quite a lot so let me know if you have any questions or comments below. I’ll be happy to help you out!